I've been looking for the average width (at widest point) of the average American male body but couldn't find it anywhere so far. When I say "widest point", I mean that if you draw a rectangle (that gives X for width and Y for height) around the whole body, all of it should fit inside the rectangle, whether the shoulders are wider than the hips or vice-versa. I'm looking for the average value of X (arms against body). If the hips are the widest point inside the rectangle, the width should contain the width of the hands that are against them. Do you have (or know where I can find) that information? Browse other questions tagged human-anatomy anatomy measurement or ask your own question. Are Young Girls Stronger than Young Boys? Do male humans have a mons pubis? What's inside the males body in the space where females have the ovaries and the uterus? What is the average speed of human sneeze? 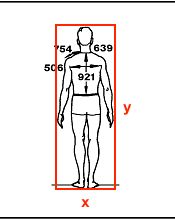 What is the average human body density?